This chart says it all. 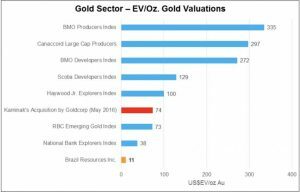 According to King World News, Brazil Resources gold resource has increased a staggering 80% from 10 million oz to 18 million oz after its most recent acquisition. As you can see from the chart, the gold value is only US$11 per oz, so the potential upside is immense should gold continue to trend higher. PC, what does it mean with gold value is only US$11 per oz. you mean its raw production cost? The US$11 per oz is the value of the gold in the ground or better known as gold resource. 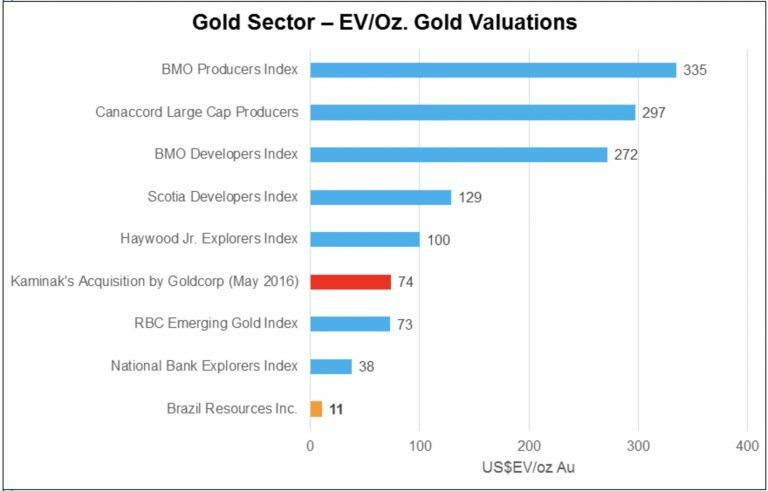 Previously, Brazil Resources (BRI) gold was valued at about US$20+ per oz. Because they just acquire another company with high gold resource, their gold resource expanded 80%. More oz of gold in the ground but marketcap was little changed, so therefore the value of gold in the ground dropped to US$11 per oz. So when you compared with other peers in the chart, BRI is immensely undervalued. If the price of gold trends upwards, BRI will have tremendous upside as the market revalues BRI’s gold resource. PC, do you think the recent BRIZF share price movement which is not quite exciting despite the recent gold price hike which could be relative to its enlarge-sized private placement? What is your latest view on BRIZF/GLDLF? Brazil Resources has changed its name to Goldmining Inc. but the ticker remains GLDLF. The company continues to acquire gold mines and land with potential deposits as it enlarge its resource base. These acquisition is done via new shares listing, hence despite the enlarged resource base, the price remain stagnant. The company is adopting a similar strategy like Silver Standard where more than twenty years ago was trading around US$1 as it continues to amass silver mines. When silver reached its peak in 2011 Silver Standard was trading at $40. 1) Appreciation in the price of gold which would then revalue its resource base on the high end. This is likely to happen when yet another economic and financial crisis engulf the world and central banks begin to print more money than ever before. This could cause the USD to fall and therefore boost gold price. At it stands, we are very near the brink. 2) If gold moves higher, GLDLF’s assets could be sold at a premium to big mining companies. Bid mining companies do not have the time nor intend to spend the capital to explore and measure a mine’s resources. They will acquire the asset outright and willing to pay a premium to do so. At its height before gold fell from its peak, mines were acquires at $200 to %500 per oz of gold in the ground. In this regard, GLDLF would benefit as its gold int he ground is priced far below it. 3) Announcement that GLDLF will start to develop a mine to begin production. This will then result in a revenue generating asset. But I think they will develop when the price of gold is high enough to ensure the best financing terms. My disclosure: I continue to hold Goldmining Inc.